A few weeks ago, at the ASLA Annual Meeting in San Francisco, the SketchUp team learned about a pretty cool piece of software called Land F/X. It's basically an AutoCAD-compatible (and thus Windows-only) drawing application for landscape architects that also happens to work with SketchUp. You can use it to create a link between a 2D view of your project in Land F/X and a 3D model in SketchUp. The integration allows you to design your project in one application and have it update in the other – pretty neat. As part of the package, the folks at Land F/X have even provided more than 200 SketchUp tree and shrub components that you can use. 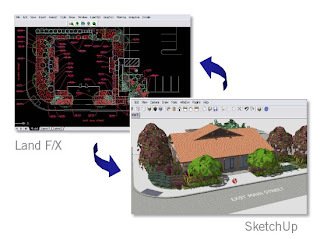 You can get more info and see how Land F/X integrates with SketchUp by going to the website. If you're interested, you should also check out some of their excellent videos: Designing with 3-D and Assign 3-D Components are both particularly relevant to SketchUp users.